home > Bradbury > Cranbrook Room specification. Flip charts - additional charge. Presentation equipment - additional charge. 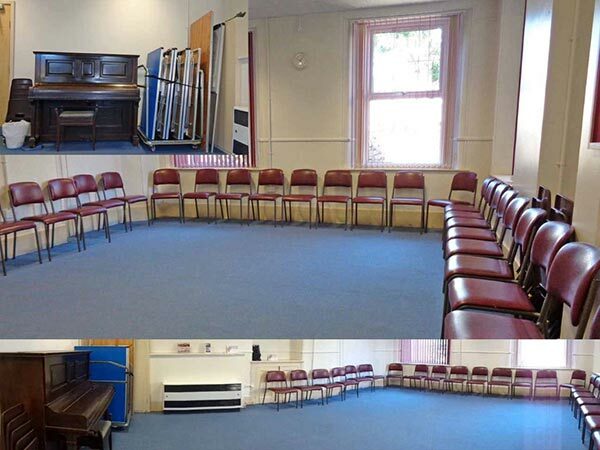 The Cranbrook Room is part of an existing building (Church House) that was constructed around 1900 but has recently been fully refurbished to comply with all the latest safety and disability requirements. There are tall windows to provide plenty of natural light and ventilation and the wooden floor is carpeted. There is level access to the Leonard Hall and the Waterford Room and the Cranbrook Room can be used on its own or as additional circulating space for the Leonard Hall. Width - 5 metres (16 feet). Length - 7 metres (23 feet). Height - 2.95 metres (9 feet). Floor area - 35 square metres (376 square feet). Access from the street is via a shallow sloping path and through a set of double doors at right angles to the room with the maximum entry size of 790mm wide x 2 metres high. Access from the Leonard Hall is via two single doors. The number of people allowed in the Cranbrook Room depends on the use and the risk assessment carried out for the event. Please do not invite the maximum numbers to your event until we have agreed that your event will comply with safety regulations. The building fully complies with all safety regulations regarding emergency exits and fire alarms etc. The risk assessment will centre on how you will get people out and away from the building in the event of an emergency. For example it may take longer to get people out in wheelchairs or prams than a youth group. We will be able to help you with this. 6 x low level tables with chairs around each table - 24. Social gathering with everyone standing - 56. Theatre Style with everyone seated in rows - 26. For every extra 1800 mm x 760 mm table used - reduce numbers by 4. For every extra 1800 mm x 760 mm table used with 8 chairs - reduce numbers by 8. 22 x stackable chairs with padded seats and backs. 30 x infant stackable plastic chairs. Additional chairs can be provided on request. 2 x lightweight aluminium folding tables with an imitation light oak top 1520 mm x 690 mm. 4 x nursery height lightweight aluminium folding tables with a blue top 1220 mm x 685 mm x 508 mm high. Additional tables can be provided on request. The Cranbrook Room does not have an internet connection. Flip charts complete with paper and pens are available. We can arrange the supply of any additional technical equipment you may need for your lecture or presentation. The Cranbrook Room has ceiling mounted Fluorescents to provide general lighting. An upright piano is provided. We can arrange to have this tuned for your event at an extra charge. The room does not currently have an induction loop system. A sound system is not supplied and should not be needed for a typical meeting or demonstration. 4 x double 13 amp socket outlets are positioned around the Cranbrook Room. Heating is provided via a fan assisted radiator which will maintain a constant temperature of 20°C. The heating, if required, is controlled via a manual timer adjacent to the door. There are 3 tall windows. The windows have vertical blinds to provide dim-out. The Cranbrook Room cannot be blacked out completely using the fitted blinds.